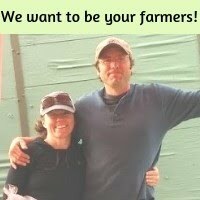 Lower Valley Farm: Don't have hours? Use Minutes! Don't have hours? Use Minutes! The sun is shining, the snow is melting, and I hope you enjoy this week's newsletter! Things are starting to get busy on the farm and some of my weekly cooking routines got lax to the point of non-existent last week. That’s why I have a routine because I’m too tired sometimes to ‘think’ about what’s for dinner. I have a habit and it makes it simpler to get food on the table. When I don’t have hours I do have minutes...so that’s what I use MINUTES! I want to share some simple tips with you today to set you up for success in the kitchen. But first, that word, ‘simple’. Let’s not confuse that with a common word we use when talking about home cooking ‘easy’. Simple and easy are not the same. Setting yourself up for success in the kitchen isn’t easy. Creating simple systems that work for you can seem overwhelming and daunting; and I’m frustrated about the amount of messaging about how ‘easy’ it is. We got sold, as a society, that the kitchen should be ‘easy’. Work in the home kitchen is incredibly undervalued, overlooked, underestimated. Do you kind of dread the moment you open the fridge, or put off cleaning it out? Have a weekly cleanout BEFORE your weekly shopping. Organize top to bottom most perishable to least perishable. Pre-cut/chop as much as possible and store prepped food in clear containers. Set the kitchen timer for 10 minutes and clean out the fridge once a week. Doing this weekly makes it take so much less time. -Start at the top and with a warm dishcloth wipe down any spills/messes. -Set leftovers that can be eaten that day our on your kitchen counter. 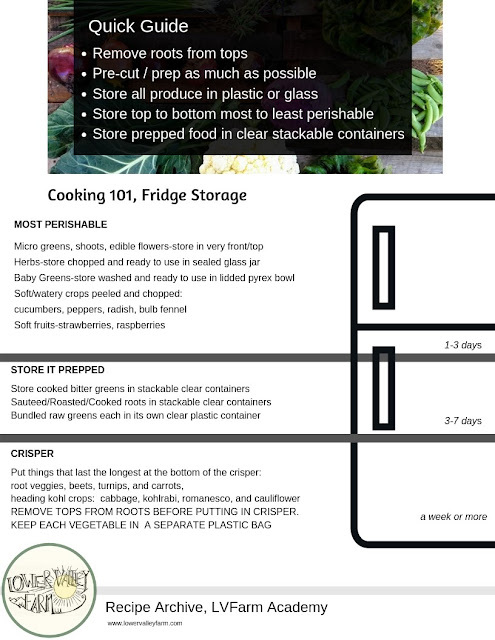 LVFarm Academy Members and Veggie Box Members you can find this fridge guide as a download in the LVFarm Academy , Cooking 101, Storage. Folks in the Kalispell area. We've got 6 weeks until our 20 week veggie box subscription starts and we would love to have you in our 2019 community. Sign up for Veggie Box! Still not sure if Veggie Box is right for you? Take the quiz and we'll answer all your questions.